The casual seashell collector gathers whatever looks good as they stroll along the shore, but some people are die hard searchers for that elusive rare shell. It should be in close to perfect condition too! Those could actually be worth some money. The three top rare shells to keep in mind while beach combing the Florida Gulf Coast area are the ones listed below. And I say “gulf coast” because that is where the best seashell collecting happens. The word “rare” can apply to many shells if you are not searching in the correct spot. For instance, I love to collect the flat, whitish, Dosinia because where I live (on the East coast) I rarely come across them. Likewise, the scallop shells I have pictured to go with this post are not rare. But interspersed with them are a couple of Kitten’s Paw shells. I never see those on the East coast beaches. My local beaches are not covered in shells. My personal list of “rare seashell finds” relates to all the shells I rarely see on my travels in my area. And that list would be long. Sanibel Island is the place to find the best seashells. It ranks among the top shelling spots IN THE WORLD. Because of the abundance of shells, finding rare shells is more likely, such as the pretty, spotted Junonia shell. I could search for a Junonia all my life over here on the east coast and never find one. But if I lived near Sanibel, or vacationed there often, my chances of finding a junonia would increase greatly. I’m not wealthy, so I will never live there, but I could get lucky on a trip over there one day. The Lion’s Paw shell (Nodipecten nodosus) is coveted by collectors. It can be as large as 6 inches across. Large shells are often what people want to find while roaming a beach. I have never found one of these amazing seashells. In fact, where I live on the East coast of Florida, I rarely find any type of scallop shell, but when I do, they usually look like the one below. The Calico scallop can be found on all beaches in Florida, and is not considered rare. I added the image here to show the similarities with the Lion’s Paw. Atlantic Calico Scallop shell – a common shell found on many Florida beaches. An outstanding feature of the Lion’s Paw scallop shell – below – is that the ridges are wider and more widely spaced. Also, the shell can be brightly colored, like the orange seen here, or even red. The image below, from Wikimedia, with creative commons license to share, is an orange scallop shell called a “Lion’s Paw”. The pretty little Scotch Bonnet (Phalium granulatum) seashell has a short, pointed spire and horizontal grooves all around it’s thick shell. Maximim length is 4 inches and coloring can be white to yellow or butterscotch. 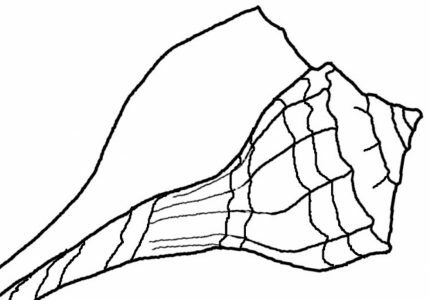 It has a curled lip along the opening and can have a check pattern, like in the shell image below. I will admit that I knew about the scarcity of the Junonia shell for years. And many people have heard of the rarely collected Lion’s Paw. I didn’t know that it could be found on Florida beaches until I did some digging (figuratively). I do not have any of the top rare seashells in my collection. I’m grateful to the people who share their photos on photo sharing sites, like Wikimedia Commons and Pixabay, which I used on this page. For the third shell listed here, the Scotch Bonnet, I visited the “I Love Shelling” blog which is written by a woman who lives on Sanibel Island. How lucky is she? I figured she would know which shells the locals consider to be “rare” and the Bonnet was mentioned. The Sanibel blogger has a page entitled, The Elite Three Shells. Nature paints with such beautiful colors! @Daniel, I have no idea how to tell the age of shells. To find that type of info maybe find a seashell forum where collectors trade information, photos and shells. Funnily I happen to have a postcard that came a week ago with “Florida Shells” on. In the centre is Junonia! I have a collection of shells and beautiful stones but mainly from the West Coast of Sweden. Hi Miriam, What a nice coincidence! Now I am wondering what types of shells are found on Sweden’s beaches. List them on popular sites like e-bay, or find a seashell forum where people are looking to buy shells.